When Vanessa asked me to come take photos of Rebekah for her birth announcement, we decided to do a few shots of the whole family. 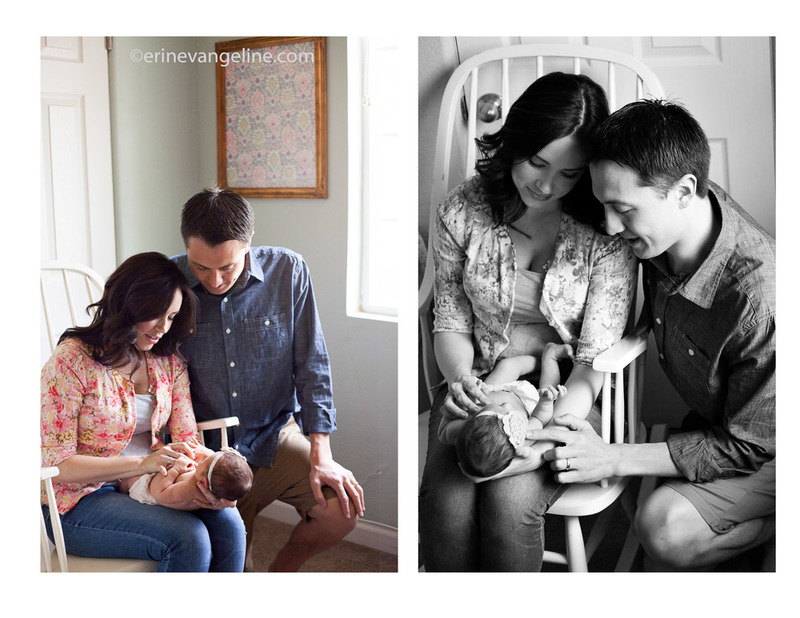 I LOVE these shots of the growing Erickson clan! Little Henry was so sweet and tender with his sister, but also so excited to run around like the two year old toddler he is, and Steve and Vanessa are simply ridiculously good looking... like seriously! I hope that you guys treasure these images of the very beginning of your time as a family of four! Besos!!! Henry couldn't get enough kisses! It was adorable! She already has him wrapped around her little finger... and can you blame him? So much love here! We were able to catch some quiet moments with Henry. They are few and far between with a two year old boy, but he was very interested in the rain outside, and how his baby sister was doing. I love how they turned out. I want to just eat him up, he's so adorable!! And then, a few of Mama and her new baby girl. I love the serenity and calm that these make me feel. Vanessa and I bonded a long time ago over the "pale-skin-dark-hair" complexions we share. People would always tell me how striking that combo is, and looking at these photos of V, I must agree with them! Vanessa, you are simply georgeous as a woman, and as a mother and as a friend! Steve came in to join, and the amount of love surrounding these two as they looked at their baby daughter was palpable. The amount of laughs were palpable, too. I tend to think that love and laughter so often go hand in hand! Thanks so the Erickson Family for welcoming me into your home on a rainy Saturday morning. I am so glad that I was able to capture some of the beauty that is your everyday with little Rebekah, and super fun Henry. I hope that you will enjoy these reminders of this time in your life for years to come!